Since I had more than a day to kill in Moriarty, New Mexico, I walked around and made a few pictures, including this sign at a local steak house. Due to a broken heater hose, I spent an extra day in Moriarty, New Mexico, waiting for a part to come from Albuquerque. By the end of my second day, I was in Page, Arizona late for the night. Once I got my car repaired and was back on the road, I headed for Page, Arizona. 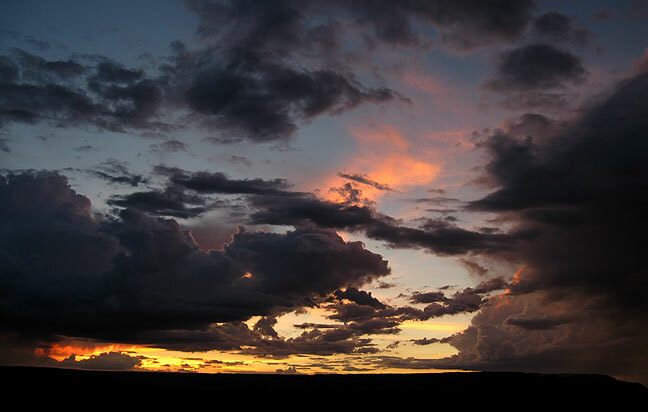 I made this image after sunset on the highway north of Flagstaff. This view looks upsteam toward the Glen Canyon Dam. 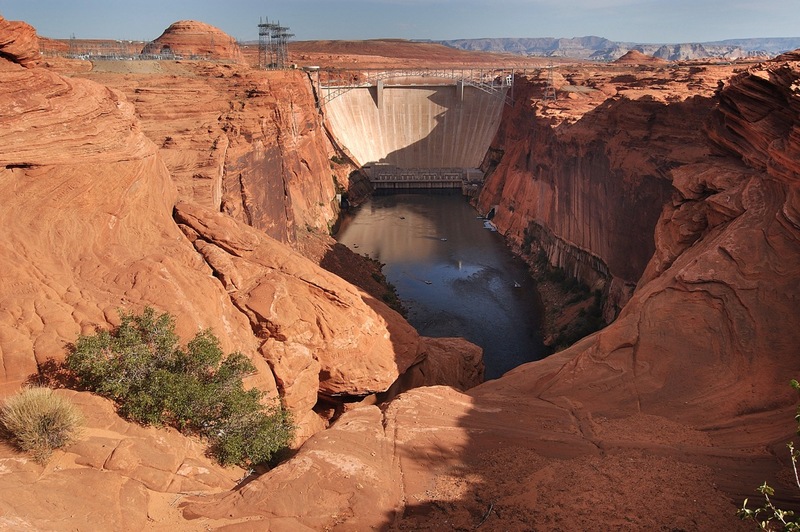 At first light, I drove around and hiked around at the Glen Canyon Dam. There were a few short trails to hike, and the sandstone formations made pretty interesting pictures. By 10 am, it was already getting pretty hot. I hiked along the east side of the water until the dam and power lines were out of site. Striations in sandstone at Lake Powell, above the Glen Canyon Dam. Small natural arch, Lake Powell, above the Glen Canyon Dam. Self portrait on a sandstone beach at Lake Powell. Whitewater rafters start their journey down the Colorado River from just below the Glen Canyon Dam. Power lines and highway bridge, Glen Canyon Dam. 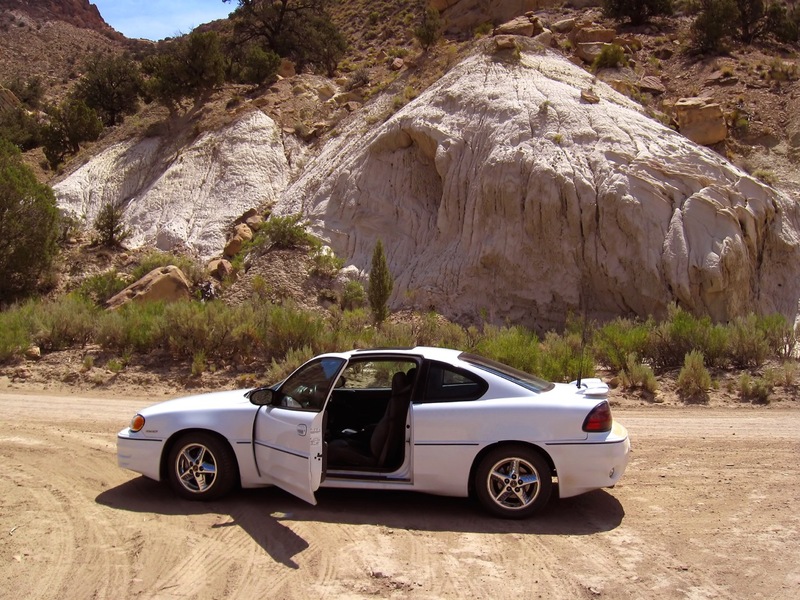 The author’s Pontiac Grand Am, with a new heater hose, sits on the road at Cottonwood Canyon. Security at the Glen Canyon Dam would let me bring neither my camera bag nor my Ralston tool into the visitor center. I took the Cottonwood Canyon road north from highway 89 toward Bryce, stopping at some views in the Grand Staircase-Escalante National Monument. The road was way rough, washboarded, and spooky lonely. 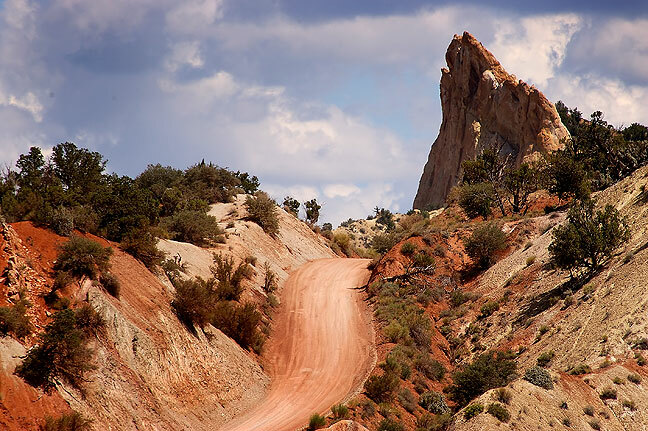 This is the rough, lightly traveled shortcut from Glen Canyon to Kodachrome Basin, the Cottonwood Canyon road. Grosvenor Arch, while popular and easily accessed, was an excellent stop. 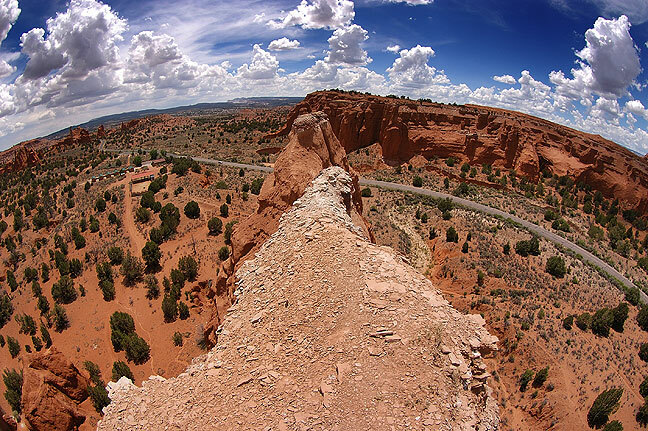 Kodachrome Basin State Park was next. It was geographically smaller than I thought it would be. Since it was mid-afternoon, it was very hot, but I did hike a couple of decent trails. The trails were poorly cairned and a little confusing, but the park was so small that there was no chance of getting lost. Grosvenor Arch, south of Kodachrome Basin State Park, Utah. Another view of Grosvenor Arch. Shakespeare Arch, Kodachrome Basin State Park, Utah. Spire, Kodachrome Basin State Park. On the trail at Kodachrome Basin. Hikers on prominence, Kodachrome Basin. 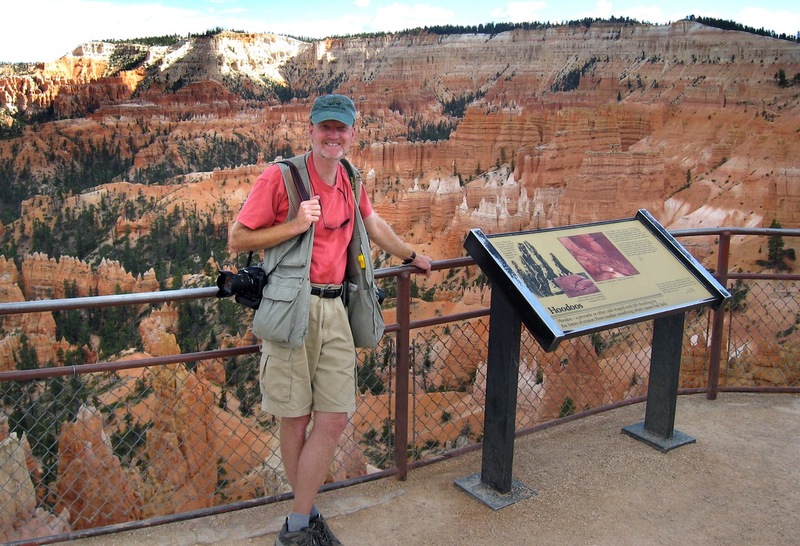 Your host poses at Bryce Canyon. 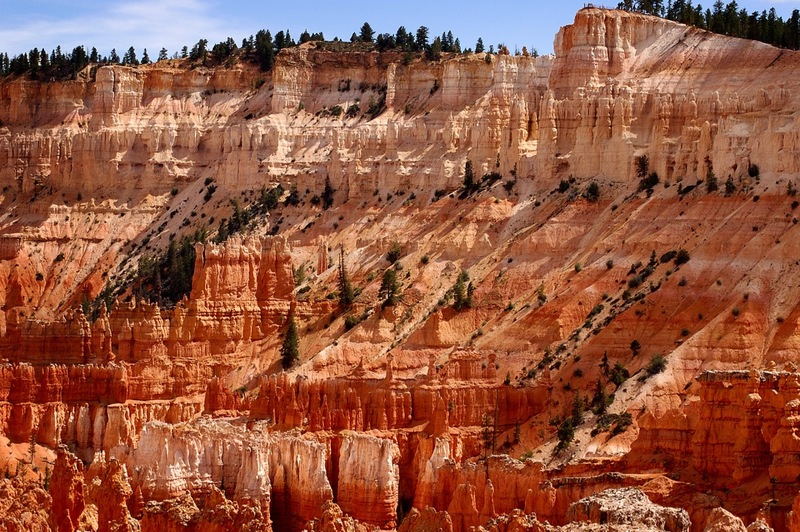 Bryce Canyon is as spectacular as one might expect, and very crowded. Even hiking into the amphitheater, I was surrounded by noisy tourists. I stayed through sunset. 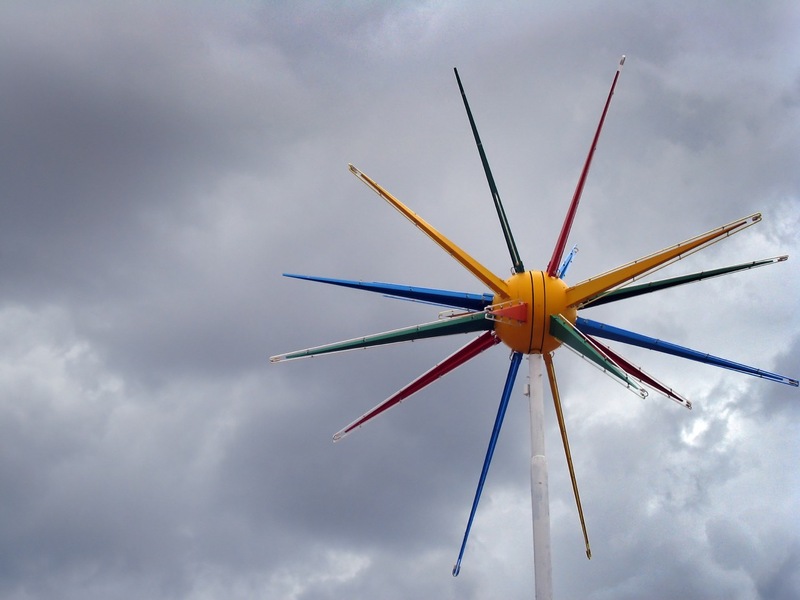 English was the fourth most-spoken language I heard, behind German, French, and Japanese. Hoodoos at Bryce Canyon just after sunset. 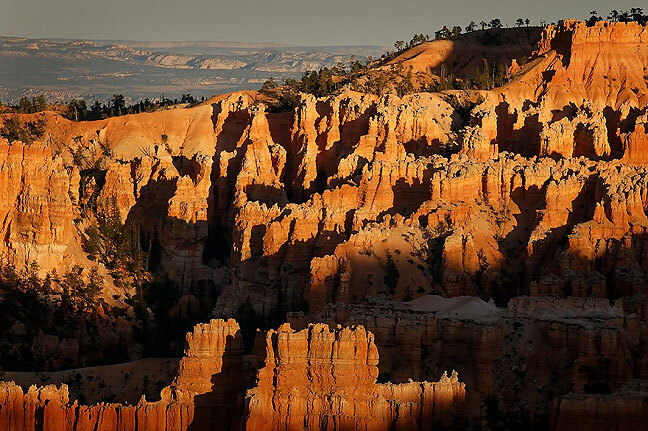 Afternoon light and shadow in Bryce Canyon. Douglas Firs grow in the Wall Street section of Bryce Canyon. Chipmunk on the trail, Bryce Canyon. Queen’s Garden trail, Bryce Canyon. Bryce Amphitheater looking toward the south rim. “Natural Bridge,” Bryce Canyon; it is not actually a natural bridge, but an arch. 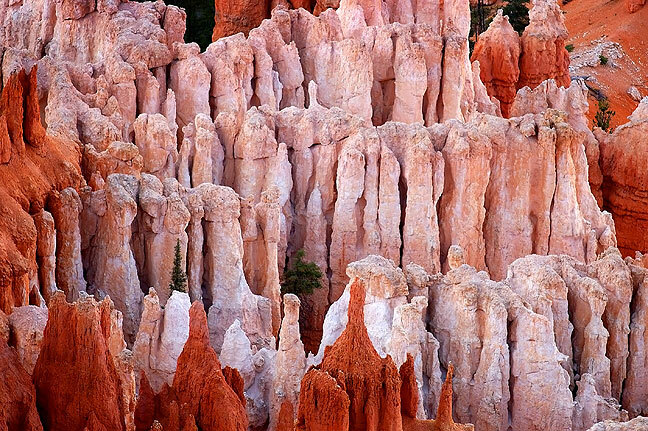 Eroded tops of hoodoos, Bryce Canyon, after sunset. Dead tree near the high point at Bryce on the southern end of the park. Slope face in light and slope face in shadow, Bryce Canyon. Bryce Amphitheater about 15 minutes after sunset. 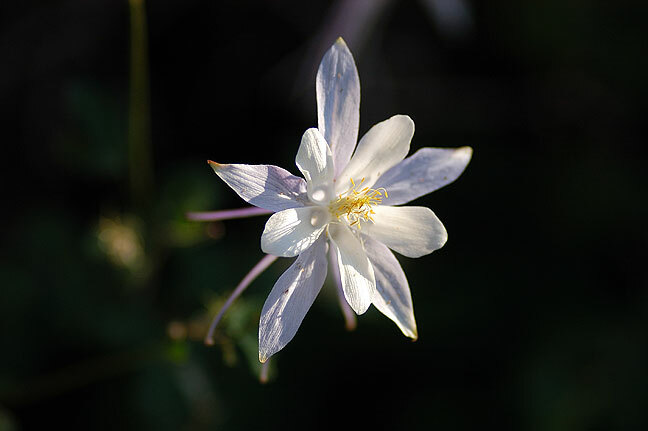 I gave my entire day to Cedar Breaks National Monument. I took several nice, fairly long, solitary hikes out to Spectra Point, then Rampart Point. It was cooler than Bryce since it is at around 10,000 feet. Blue skies. Unlike Bryce, the trails don’t lead down into the amphitheater. It was a very different hike down to the Alpine Pond. The pond was quite small, surrounded by Bristlecone Pine trees, many of which were dying from pine bark beetle infestation. Cedar Breaks National Monument amphitheater viewed through Bristlecone Pines. Bristlecone Pine Cedar Breaks; many of these ancient trees are dead or dying due to a pine bark beetle infestation. 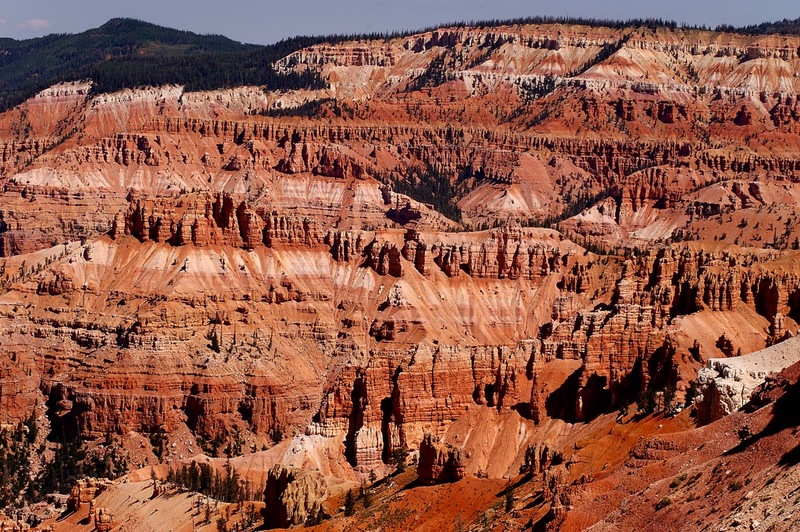 Some of the trees in Cedar Breaks have been growing for 1000 years. Alpine Pond trail, Cedar Breaks. Along the Alpine Pond trail, Cedar Breaks. Highleap Canyon seen from North View, Cedar Breaks. 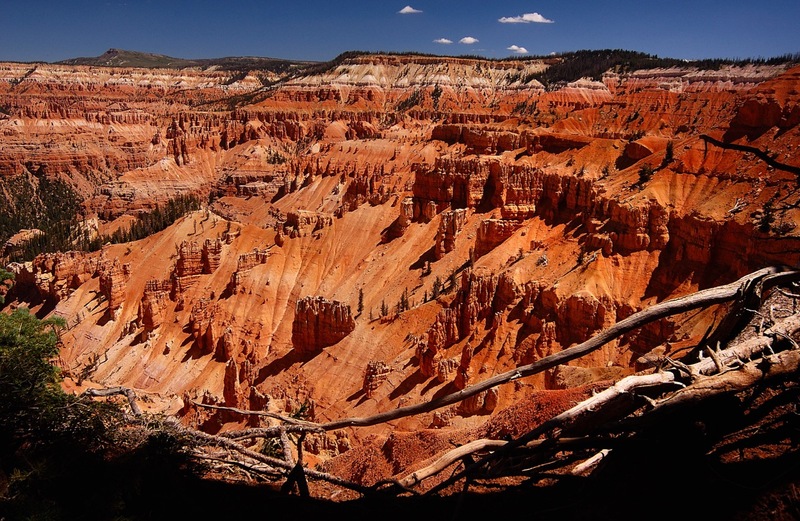 Cedar Breaks is above 10,000 in elevation, and the air is dry and clear, and the sky is deep blue. My trail at Cedar Breaks followed the back of this ridge. Lavendar Canyon from North View, Cedar Breaks. With a few hours to kill, I drove up to the regional high point, Brian Head, which featured excellent views and complete privacy. Boulder field with shelter house in the distance, Brian Head Peak, Utah. Fisheye view of shelter house, Brian Head Peak, Utah; the peak, at 11,307 feet, is just above the tree line. 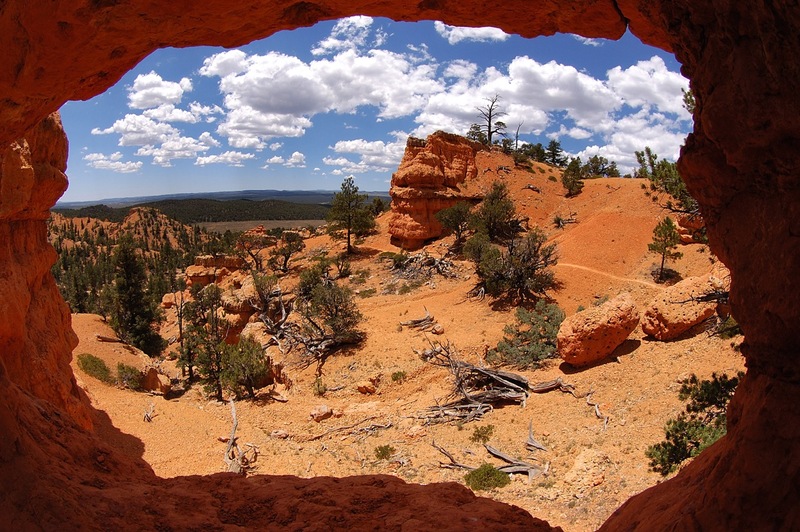 View from inside the shelter house showing Cedar Breaks National Monument in the distance. Cedar Breaks National Monument seen from Brian Head Peak. 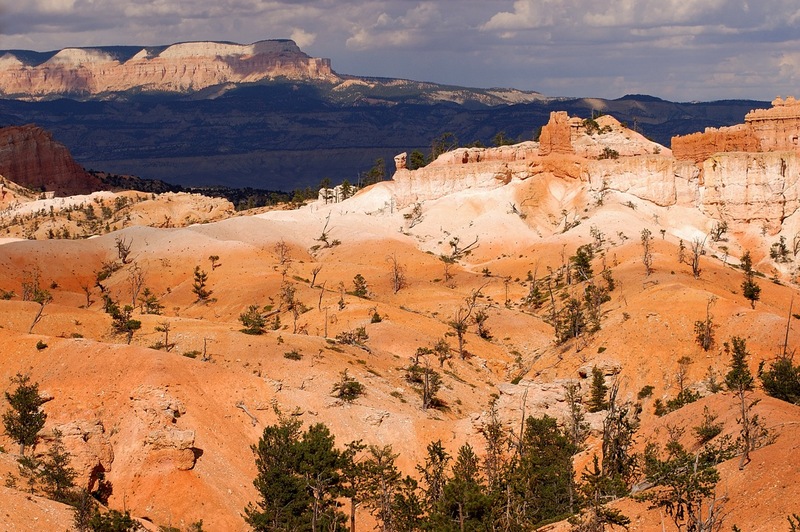 From the other direction: Brian Head Peak viewed from Cedar Breaks. 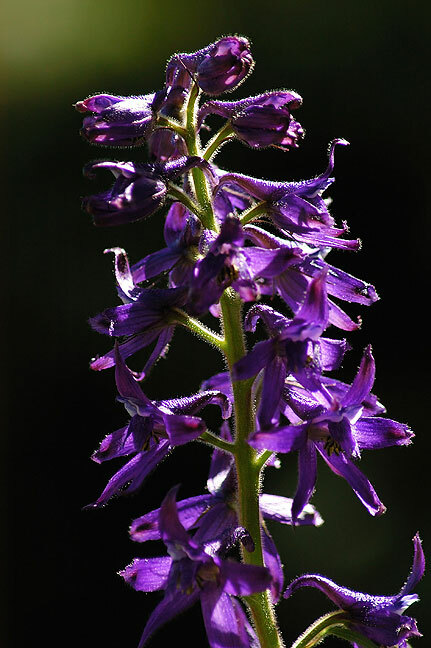 Wildflowers below Brian Head Peak. 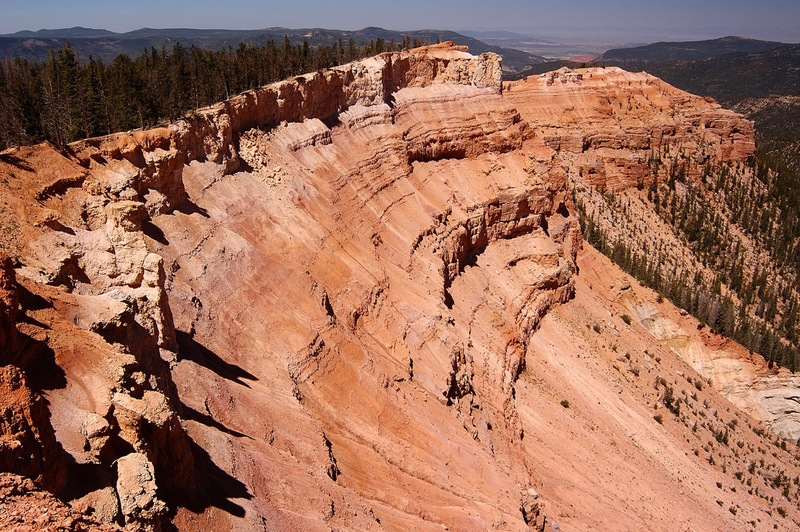 Despite it’s epic beauty, Cedar Breaks is surprisingly small, and there isn’t all that much to do, since the trails don’t lead down into the formations. I finished the evening with sunset at Cedar Breaks. These hoodoos in Red Canyon form a unique triple arch. Since I was staying just 12 miles away, I thought I would be remiss in my duties not to at least drive through Zion National Park. At this time of year, however, it is quite hot and quite crowded, so I didn’t stay long or hike. I discovered a nice visitor center at Red Canyon west of Bryce, operated by the U. S. Forest Service. I hiked a nice one-mile loop trail in Losee Canyon past some very interesting red sandstone arches. Losee Canyon Natural Arch, Red Canyon, Utah. Small natural arch, Red Canyon, Utah. 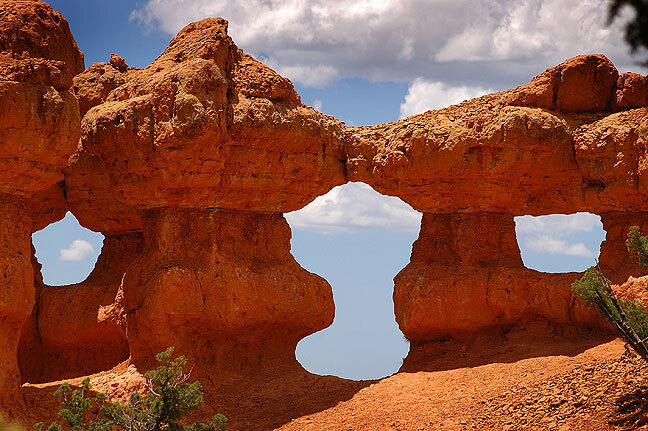 This small natural arch perfectly frames the canyons and sky. Cliffs and tree line, Red Canyon, Utah. I ended the day back in Bryce, sort of tying up loose ends; visiting overlooks and short trails that I felt might make pictures. Nice day. 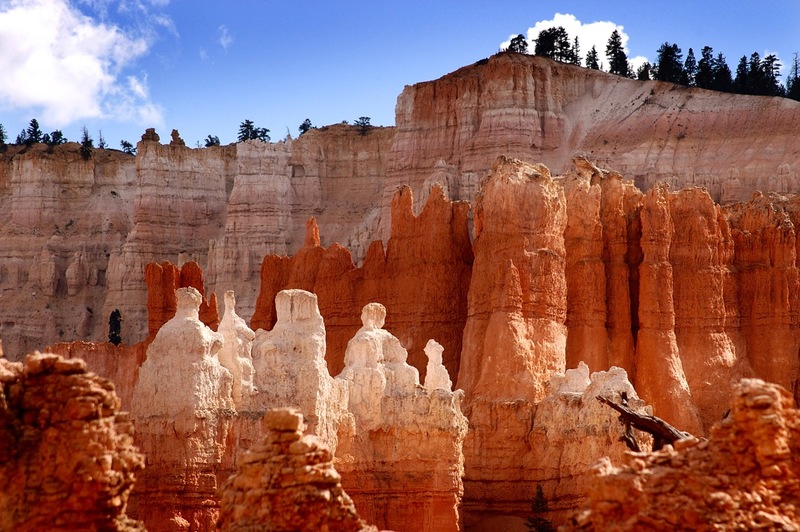 Bryce Canyon is complex and visually stunning. Since I was visiting in the summer, Bryce Canyon’s formations were bright and colorful, but I would love to photograph them in the snow or at night. 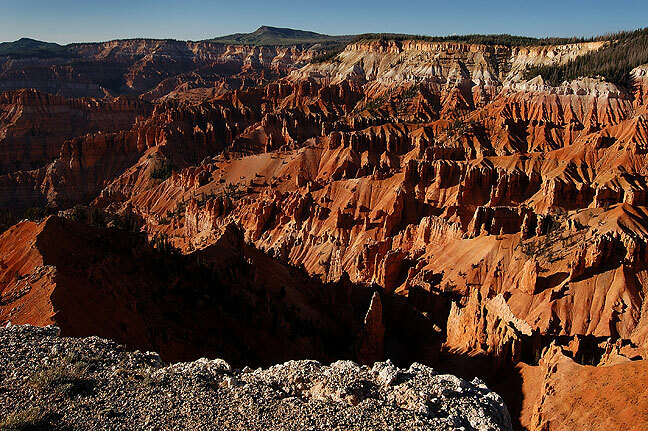 Bryce Canyon is accessed by a ridge that runs the length of the park, and affords excellent views far across southern Utah. 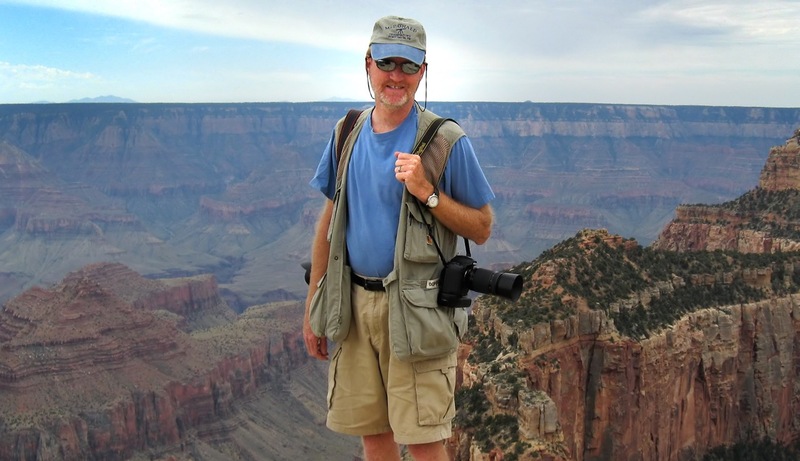 Your host poses for a photo on the North Rim of the Grand Canyon. As I began to make my way back toward home, I stopped at several choice points along the way, including Wupatki National Monument and Sunset Crater National Monument. My first venue was the north rim of Grand Canyon National Park. It was a nice drive, and it was, as I had heard, not very crowded, but I didn’t have very good light, so I felt I was missing the true majesty of the place. Grand Canyon National Park from Bright Angel Point, north rim, morning. Grand Canyon National Park from Point Imperial, north rim, with Marble Canyon in the distance. Angles Window, Cape Royal, Grand Canyon National Park. 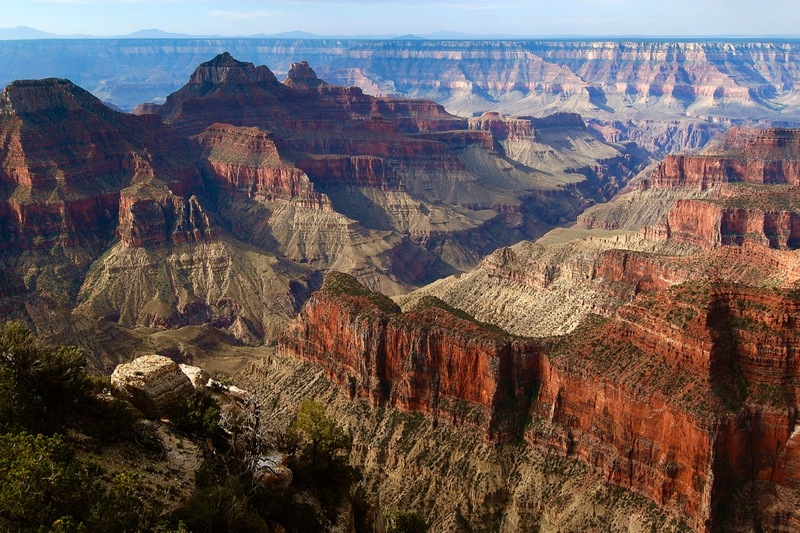 The Grand Canyon is really hundreds of canyons feeding into the Colorado River a mile below. Despite spending more than a day doing nothing due to car trouble, I felt I was able to accomplish most of my goals on this trip. I am happy with the result.